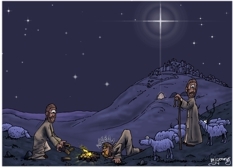 The stars (particularly the bright one over the cave near Bethlehem) provides the cool blue light of this scene. In contrast to that is the warm yellow/red glow of the shepherd’s camp fire. You can see highlights of that warm glow on the figures & surrounding ground. I decided to have the large star beginning to shine. 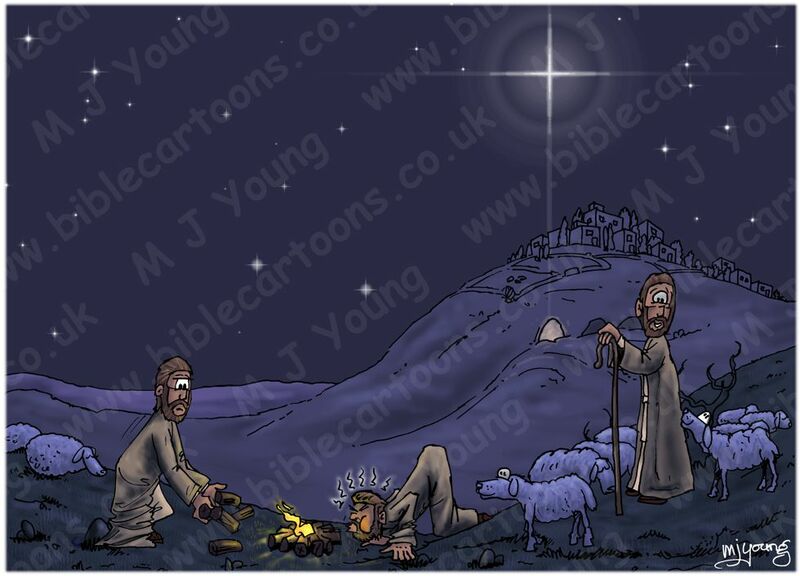 It is fully shining & very big & bright in the Scene 04 – Shepherds & Angels & Scene 05 – Angelic host Bible Cartoons. I had a bit of fun with the middle shepherd, who is blowing like crazy to get their campfire going; notice his red cheeks!